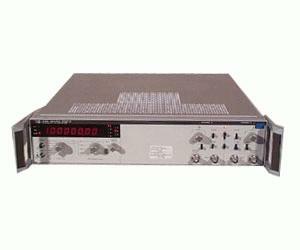 The Agilent 5328B offers sensitivity of 25 mV rms to 40 MHz, 50 mV rms from 49 to 100MHz. 9-digit LED display. Programmable with functions, resolution, sample rate, (maximum or manual control), arming, display modes, measurement modes, output mode, and reset commands. Trigger level, trigger slope, input impedance, coupling, separate/common/check, invert A and B are also programmable. Trigger level is programmable in 10 mV steps in x1; 100 mV in x10. Option 010 adds a high stability time base. Option 031 adds a 1.3 GHz C-channel. Option 020 adds a digital voltmeter. Option 040 adds expanded GPIB control.